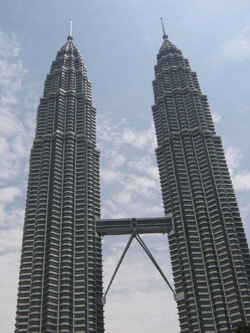 The Petronas Twin Towers in Kuala Lumpur have been a gigantic construction site launched in 1992. Titanic because their image: a height of 452 meters for 88 floors they were the highest in the world to complete the construction. Only the tower Taipei 101 (Taiwan), built in 2004, which now surpasses with its 509 meters. For the number of floors is the Sears Tower in Chicago holds the record, 110 floors. The Petronas towers are interconnected together by a suspension bridge. They weigh 270 000 tonnes! In order to create a healthy rivalry, two Japanese teams (Hazama Corp.) and Korea (Samsung Engineering) but conducted both by Anglo-Saxon, returned to competition speed, each with its tower. Completed in 1998, these twin towers house, among other things, the headquarters of the company Petronas, a company created by the Malaysian state and specialist materials. They cost 1.8 billion U.S. dollars. César Pelli, former dean of the School of Architecture Yaleet father buildings such as Canary Wharf in London, World Financial Center in Manhattan, was chosen as architect. Originally the towers were to reach only 527 meters, but the prospect of record for the authorities eventually altered plans. Also on Prime Minister Mahathir, the double building was designed in inspiration of Islamic art, ie without human representation but with geometric shapes and symbols. The Petronas towers look like a star at 8 points in Islamic culture is a symbol of unity, harmony, stability, and rationality. Concrete was chosen because it is less expensive than steel. Malaysia would have to import large quantities of steel while the concrete was cheaper. Reinforced concrete also resists 2 times better than a steel structure vibration. It was however a repeat of floors, the special concrete was poorly determined. To cut short the spiral of fear, Contol of concrete were increased for each new floor installed. 60% of the products used are local products: concrete, wood, glass, ceramics ... The facade is for its stainless steel. The skybridge, or suspension bridge asked a feat during the break. There were also many calculations for wind resistance, etc..
A 60% completion of superstructure, one of 2 teams of construction s'aperçu the bad inclination of the tower. It's catching the small angle on the remaining floors. 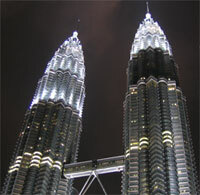 The Petronas Towers have 78 lifts including 29 double lifts at high speed. When designing, the problem of performance of travel time arose as the limited space to install as many lifts! He had to find how to transport the 10,000 people moving into the towers every day. The elevators do not serve any while the story is that the solution has been found to provide a convenient location fast enough given the space. Thus, the peer floors are served by the elevators on the ground floor, uneven floors by the elevators on the 1st floor. It takes 1 min 30 sec to reach the summit from the basement. The double lift platform can carry 52 people (2 x26) at a speed of 6 meters / second. The bridge between the 2 towers, located at 41st and 42nd floors, overlooking the ground of its 150 tonnes, nearly 170 meters. It was also built for safety reasons in case of fire, to evacuate the upper floors. Its setting up was not difficult and this new item includes strong wind constraints. 16 pillars suportent each building and theory 3 could collapse without the tower collapses. A very high density concrete foundations composed, another concrete has been studied specially for the rest of the building, while coinstruit concrete and therefore heavier than a tower with steel structure. Two months are needed to clean the windows. Security has been tightened following the attacks of September 11. But the building houses a mosque, a guarantee of security? Not given the size of stores devoted to capitalism, more than 1 million square meters! But the tower also wants representation in Islamic art. Add to bookmark this page Malaysia " Twin Towers " - Firefox do "Ctrl D"